There was a 20-men leading group. When the group came to the feed station in Arras (stage 6 of Tour de France 2014 has started from the town), Coppi attacked. In these years, it was OK to attack in the feed station, or when a rival is punctured. He took only team Mercier-Htuchinson’s French rider Maurice Diot for company. 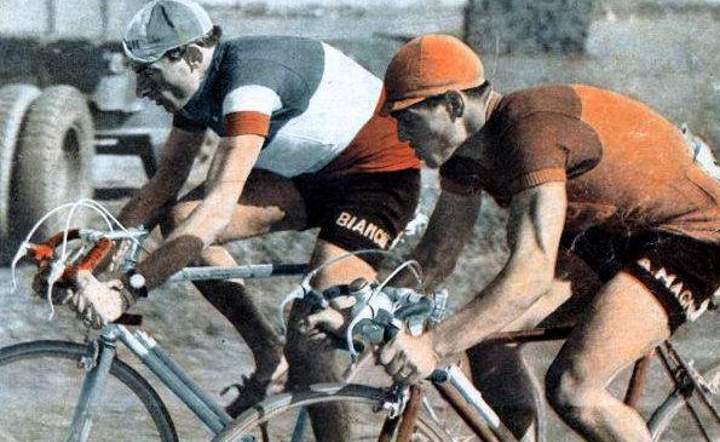 Diot’s director Antonin Magne told Diot not to work with Coppi. In response to Magne’s orders, with 45 kilometers to go, Coppi went solo, riding a 52×15 gear all the way to Roubaix velodrome. 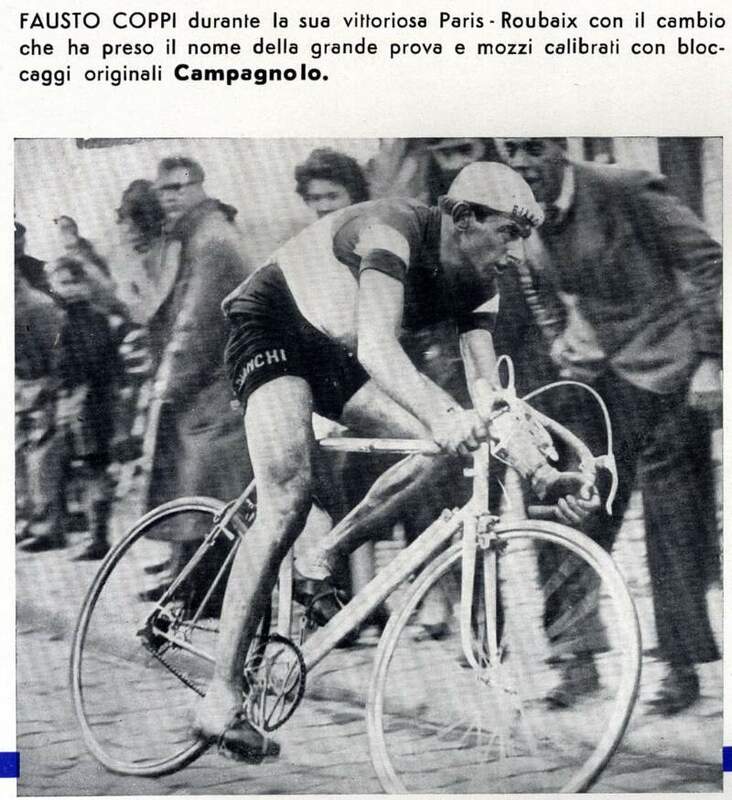 Fausto Coppi was using the Campagnolo single lever (on seastay) rod shift system named “Paris-Roubaix”. This system was an improvement over the dual lever “Cambio Corsa”. 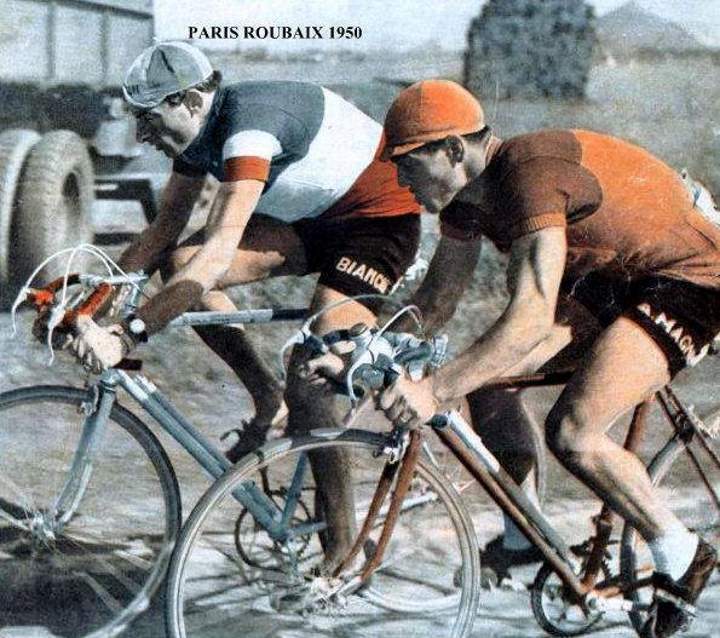 Soon after the “Paris-Roubaix” Campagnolo developed the first Campagnolo parallelogram derailleur, the “Gran Sport“, which relegated their rod shifters into the history books and collectors. 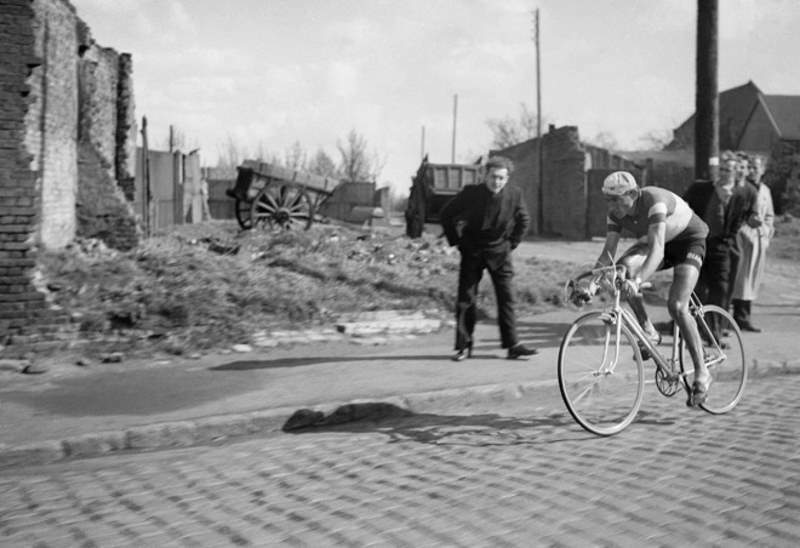 Fausto Coppi on his way to winning the 1950 Paris-Roubaix. Maurice Diot (b: Paris, 13 June 1922; Migennes, d: 4 March 1972) was a French professional road bicycle racer. In 1951, he won the Paris–Brest–Paris race of 1200 km, in a record time that has not been broken since. Antonin Magne (b: 15 February 1904; d: 8 September 1983) was a French cyclist who won the Tour de France in 1931 and 1934.Magne also won the 1936 UCI Road World Championships, and Grand Prix des Nations, triple (1934, 1935, 1936). He raced as a professional from 1927 to 1939 and then became a team manager. The French rider and then journalist, Jean Bobet, described him in Sporting Cyclist as “a most uninterviewable character” and “a man who withdraws into a shell as soon as he meets a journalist.” His taciturn character earned him the nickname of The Monk when he was racing.